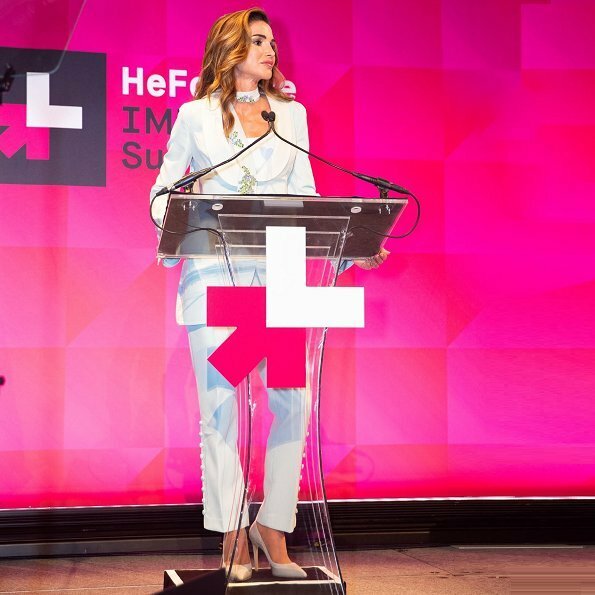 Queen Rania of Jordan attended the annual 'HeForShe' IMPACT Summit held at Cipriani Street in New York. 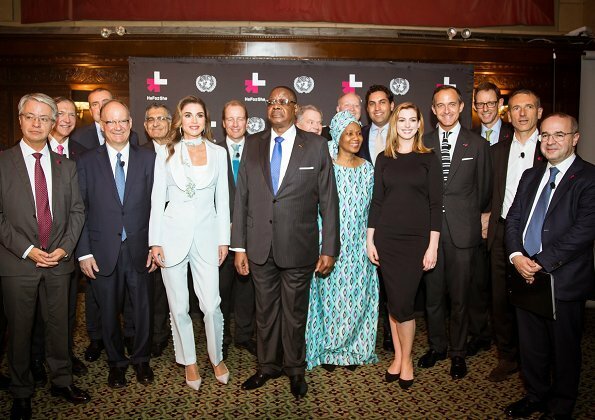 The HeForShe IMPACT Summit convened world leaders, global CEOs, university presidents, and public-sector leaders to share groundbreaking practices and concrete solutions towards the achievement of gender equality. 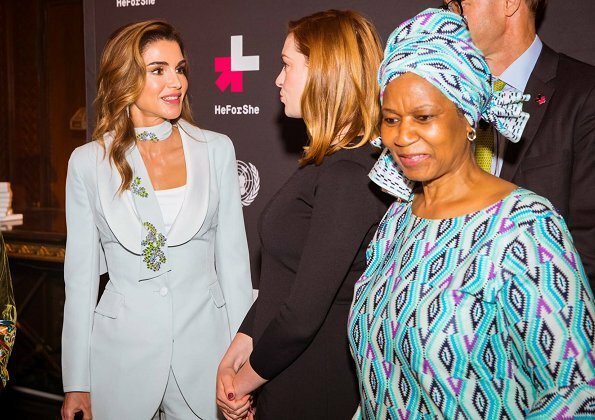 Other speakers at the event included the presidents of Finland, Rwanda, Iceland, and Malawi, as well as actress and UN Goodwill Ambassador, Anne Hathaway, and actor and activist, Winston Duke. (Queen wore a jacket and trousers by Ermanno Scervino). Since its launch in 2014, the HeForShe solidarity movement has mobilized 1.7 million men as advocates for gender equality, and generated more than 1.3 billion conversations on social media. Great pantsuit. Rania looks better than the model! Very stylish suit. Rania looks great. Love the jewelry to. Rania you look wonderful in your suit. It is a well cut but unusual suit (the buttons down the legs look odd and the sleeves are very wide and also have those buttons but they don't stick out like they do on the legs) but I will say... she looks amazing in it. She pulls it off and to me, she adds more to the overall look of the outfit. It's a lovely colour too. Rania ..ur my favourite. So royal n regal. Dnt see women like u nowadays. Loving the pant suit. Very sleek and simple. Hate the pant suit, ill-fitting and odd-looking. Love her shoes. Very stylish with the suit. Rania always looks well put together. I am rather ambivalent about this suit. I like it as a concept, but there’s something about it that I feel could be improved (probably a tailor could have fitted it better). I sincerely admire her, she is a good model for balancing one’s tradition and beliefs with the modern day reality. Must be more difficult than we, in Western world, can appreciate it.